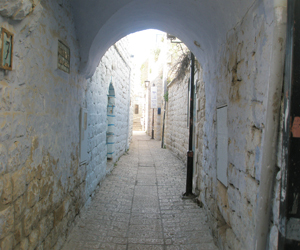 When British-born Yedida and Scottish-born Mark Cohen arrived in Tzfat in the late 1980s, their backgrounds gave no clue as to their future as writers, publishers, and disseminators of Kabbalistic teachings. Yet, as Yedida says, both she and Mark had always had an interest in questions relating to the essence of the human being, the purpose of creation and our role in it as human beings. Mark studied philosophy and first became interested in Kabbalah from an academic point of view; Yedida became interested while researching Physiology, at the order intrinsic in Creation. Later when she studied for her M.D. and her specialization as an anesthesiologist she looked for an aspect of Judaism which could answer questions relating to pain and suffering. Yedida and Mark began to collaborate, and their first project was "In the Shadow of the Ladder- Introductions to the Kabbalah" by Rabbi Yehudah Lev Ashlag. This work involved translating directly from the Hebrew the Introduction to the Zohar, and the Introduction to the Study of the Ten Sephirot by the well-known Kabbalistic scholar Rabbi Ashlag, as well as adding explanatory chapters to put it all in context. They established their own publication company, Nehora Press, in order to retain control of all the editing and production, as they felt that authenticity in dealing with this very sensitive work was vital. Mark died suddenly three years ago, but Yedida, still raising her young family, has carried on his work, teaching classes and groups through the Nehora School, doing audio-talks on podcasts, radio, and over the internet, and continuing with writing. Some of their publications include Ma'arag L'Neshama (Hebrew) and it's English translation, A Tapestry for the Soul - the Introduction to the Zohar by Rabbi yehuda Lev Ashlag. These works explain R' Ashlag's Introduction using excerpts collected from his other writings, and include suggestions for one's inner work. They are already being used by both beginners and advanced students. Yedida is enthusiastic about the reaction to her work. "It's amazing. First of all the authenticity of our translations is very appreciated and welcomed. Our works are endorsed by Rabbi Gotlieb Shalita of Ohr Baruch who is one of the foremost students of Rabbi Baruch Shalom HaLevi Ashlag z"l teaching today." Yedida sees that people who have heard or learned something of Kabbalah are looking for ways to go deeper. "Genuine texts are of great importance as they are a direct source" she explains. "The response to Ma'arag L'Neshama here in Israel is very heartfelt. People tell me how it has changed their perspectives on their lives and purposes and has helped heal relationships . Study groups are springing up around this work. These books are interesting and appealing to Jews of all backgrounds. But they are quite hard work. They involve real study. Interestingly not only Jews are attracted to our work but non-Jews as well."